1.1 How to Get Rs.100 off on Rs 200 order ? 1.2 How to Get Rs.250 Food Free? 1.3 (Over)How to Get Rs.500 Food Free From Faasos? Faasos Cashback Offer – Hey Coolzdeals Readers, We Hope all are enjoying Amazon Pay Balance Add Money Offers and take benefit of PhonePe Wallet Offers. As always we post amazon quiz first on the net with all correct answers. Late delivery, cold food, no change, low quantity, or same old Dal Khichadi Or Pizza – we wanted to solve this madness for you. So we built a whole new App for you that is a single point to order all your food – Breakfast, Brunch, Lunch, Dinner, Desserts, Starters. Any time, Any craving, Any Food, the FAASOS APP finds a solution for you. Faasos app is Giving 100% Cashback up to Rs.250. You will get 100% Credits in Faasos App. have to Just Follow the Below Steps and you will able to get Free Food. See full details from below. How to Get Rs.100 off on Rs 200 order ? 2. Sign up with Your Mobile Number. 3. Order Food from Your Desired Restuarant. 5. Now, On Checkout Pay with the Suitable Method. Pay with Wallet to Get Extra Benefits like Rs.50 Cashback with Paytm and 100% Cashback with Paypal. 6. Done. 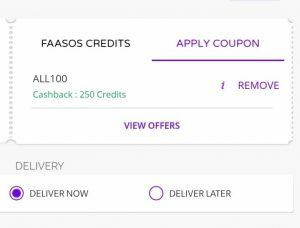 With Promo code you will get Rs 100 Cashback in Faasos Credits. How to Get Rs.250 Food Free? 6. Done. With Promo code you will get 100% Cashback in Faasos Credits as Rs.250. 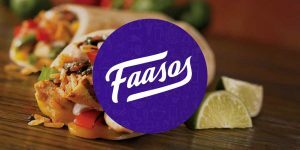 (Over)How to Get Rs.500 Food Free From Faasos? 2. Now, Sign up with Your Mobile Number. 3. Prepare an order from your Favourite Restuarant. 5. Go for Payment Method and Choose Paypal as Payment. 6. Pay with Paypal and get 100% Cashback up to Rs.200.